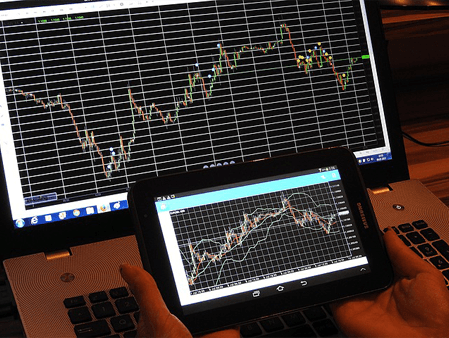 Forex Articles What is a Trading Platform? A trading platform can be defined as a software, which functions as an info­rmation conduit between a broker and a trader. It offers information like charts and quotes. A trading platform also includes an interface through, which a broker can enter orders. The trading platform software could be installed in the computer of the trader and is compatible with Linux, Windows and Mac systems. Many brokers provide web-centric software too. These platforms run Java, a web language. The web-centric trading platforms have the advantage of being used on almost any computer. The only condition is that the concerned computer must be connected to the internet. Trading platforms are mostly available without any charge. Many brokers offer platforms with different functionality level for more active traders. In case you wish to make a career in Forex trading, then it is important to select a good trading platform. A better platform makes a powerful tool in the trading process. The rule of thumb is that good forex brokers provide good forex trading platforms. You should look for a number of useful features in a trading platform, so that they help you in enhancing your trading experience. Needless to say, accuracy is important to trade in the currency pairs you are interested. The requotes risk must be avoided and it is vital to know the time when the market changes. If you know it, you can initiate your trades in a timely manner and adequately monitor the risk too. The majority of trading platforms that are available to you operate online. There is a need for a reliable and stable internet connection. The connection must also be of high speed. The trading platform must execute the deals reliably and quickly. There should not be any potential costly requotes. You can save a considerable amount of time if the trading platform permits you to directly manage your trading account. After you have created your own forex trading position, there is a need to keep track of your account balance and manage it. You must track your trading profits in real time with the movement of the market. The ideal trading platform must offer the correct account management functions. Your chosen platform must permit quick entry of all kinds of orders you could possibly need. These would include the taking of profits, managing the stop losses and also a minimum of trailing stops. The OCO feature comes in handy in avoiding execution of any multiple orders mistakenly given for the same position. Any better trading platform will offer a complete set of technical analysis tools which must include charting. Other features include popular indicators applicable for currency pairs which you want to trade. The charts must be updated in real time for a number of time frames. A useful feature is that you can trade directly from the charts. If you use live trading accounts, you must be concerned about the safety of your account login information and personal data. Ensure that the platform is operational under the correct internet security protocols. Do back up account information for extra security. Any trader who uses fundamental analysis must have access to live news feed through the platform. It would be great to have access to an accurate calendar for economic data release when the due period comes.